It's 30 years since the launch of Hard Drivin', a video game which grandly described itself as the "World's First Authentic Driving Simulation." Previous car games had been two-dimensional scrollers, Hard Drivin' put you into a blocky supercar in a 3D environment made from rendered polygons. There were other cars to race, a variety of objects to crash into and even a loop-the-loop. The console version had rudimentary modelling of oversteer and understeer, plus a steering wheel that juddered when the limit was approaching plus a four-speed manual gearbox and even a clutch pedal. As soon as it appeared at my local arcade I became obsessed with it to an unhealthy degree. I once chose to walk three miles home so I could use my 20p bus fare for one more go. Of course, Hard Drivin' simulated real car behaviour about as well as a glass of water simulates the Atlantic Ocean, the imagination of players filling in the experiential gaps. Three decades and what's probably at least a billionfold improvement in processing power has brought us to the other extreme, with top-flight simulators now capable of replicating reality even better than they appear to. 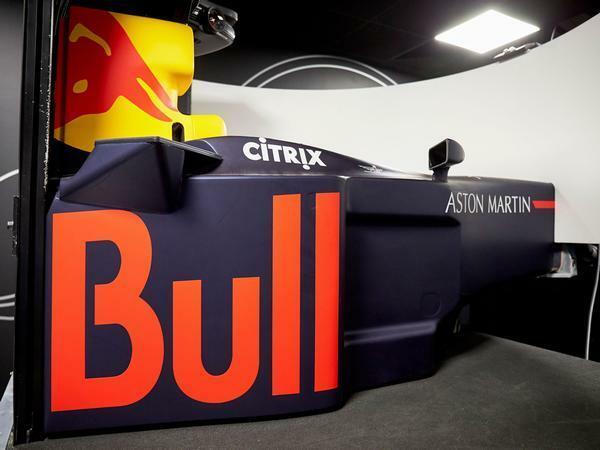 Red Bull Racing has led simulator development for years, and now the F1 team's expertise has been drawn into development of the almighty Valkyrie, with advanced work going on even before the first physical prototype is finished. I've been invited to Milton Keynes for a glimpse at what a simulator and also to have a virtual experience of what the finished Valkyrie should be capable of. Aston's chief test pilot, Chris Goodwin, is here too, both to show me the ropes and to derive some amusement from what are likely to be some fairly spectacular mistakes. 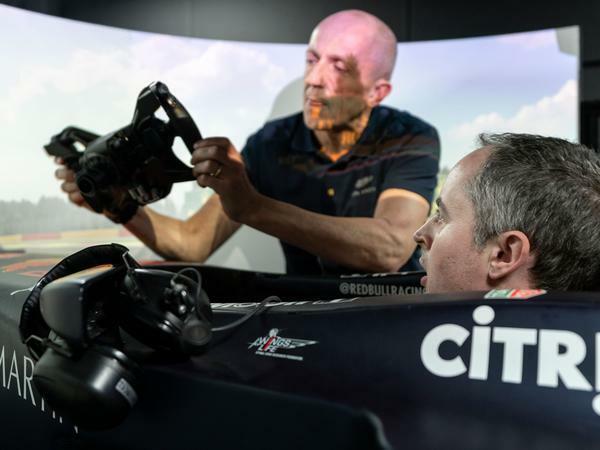 Goodwin spent plenty of time in simulators during his long service with McLaren, but says that his experience at Red Bull working on the Valkyrie has taken things to another level. "I've been using them for 19-odd years and thought that I'd been at the cutting edge," he says, "but what hits me here is the rate of development we've been able to drive forwards using what are outwardly the same tools." 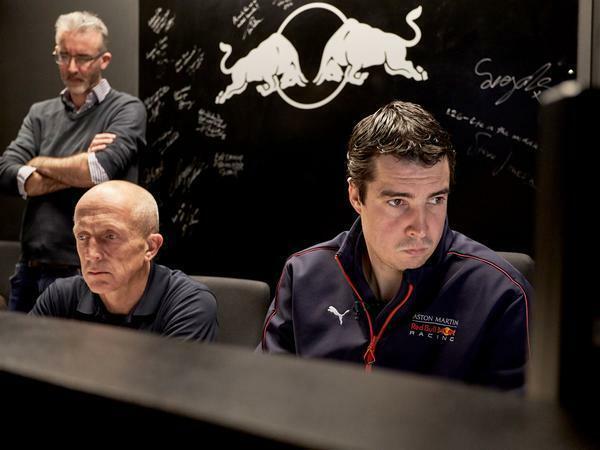 In practical terms, that means Goodwin has come to RBR's HQ for 31 different simulator sessions during which time he has driven 8500km in what has become an increasingly advanced software model of the Valkyrie throughout that time. 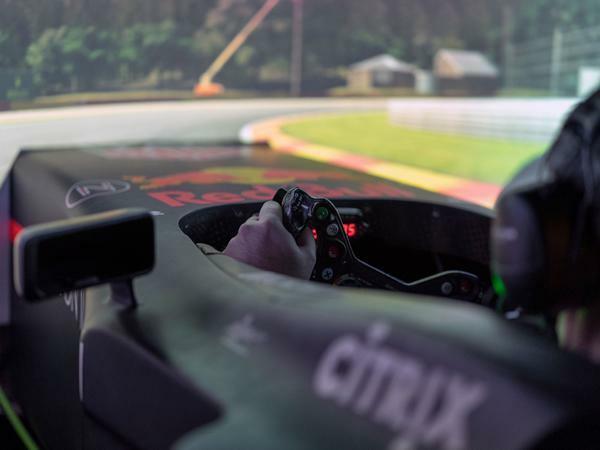 The car is evolving because data from the simulator sessions is being shared with suppliers, who are using it to test real parts and then sending info back on how they cope so that the model can be tweaked. 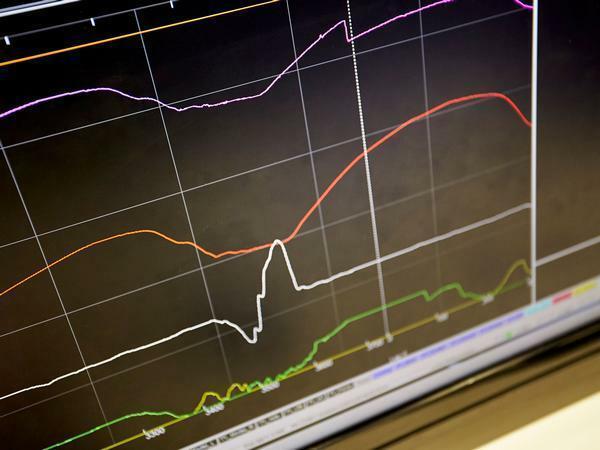 So Goodwin's laps of a virtual Silverstone have been used for the dyno test sessions for the prototype versions of the Cosworth V12 to make sure it matches the predictions, the real behaviour then reported back to the sim team. On a more prosaic level, it's cut down dramatically on Goodwin's air miles. "It's transformed my life this last year," he admits, "Gianfranco in the Rive Del Sole hotel in Nardo hasn't seen me for months. He probably thinks I'm dead - this is the first winter for years I've spent in England." Physical development with conventional prototypes will follow, of course. But a huge amount of the basic work has already been done, saving massive amounts of time and money. It also means the Valkyrie's hugely complex systems can be checked for conflicts or unexpected behaviour: it is set to have adaptive suspension and aero and a super-trick ESP system to make it driveable. "Without simulation you wouldn't be able to do a project like this given all the time in the world, it would just be unaffordable, it would take years and years," Goodwin says, "but we can drive the car in a huge number of scenarios and make sure that everything is robust, the whole thing is a homogeneous package, that the aero characteristics will be singing the same tune as the active suspension." 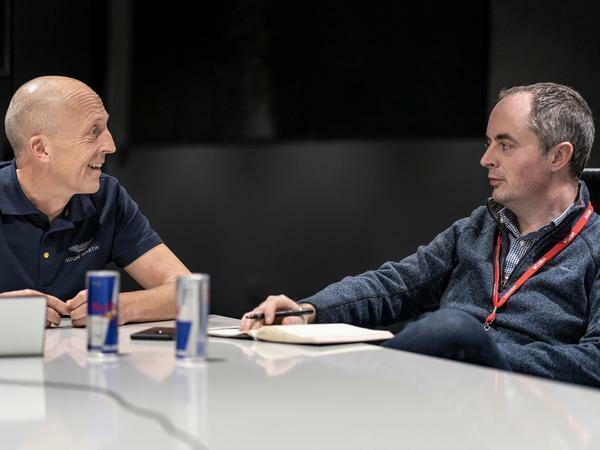 James Knapton - Red Bull's Head of Vehicle Science - adds that the Bosch stability control system will soon be running live, getting the same inputs from sensors as it would do on a real car, and then outputting its decisions straight into the model. So, um, what ESP is it running now? "It isn't," Goodwin says, "there's no ABS either." It's only the fastest car in the world - what could go wrong? 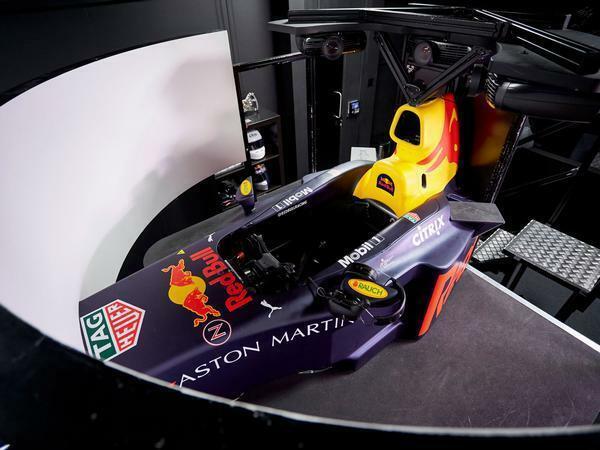 The dynamic simulator being used by the Valkyrie is tucked away behind Red Bull Racing's reception and isn't quite as advanced as the systems being used for Formula 1 work elsewhere in the building, but obviously shares plenty of parts. Most obviously a genuine F1 car tub in slightly battered livery. This is on a raised platform - getting in means climbing a ladder counter-intuitively - with this giving actuators the space to move it safely to simulate loadings. There's a wrap-around screen with three projectors; it's surprisingly dark - with the lights in the room up it's hard to see the rendered version of Spa that they are showing as I try to squeeze myself into what is basically a carbonfibre tuxedo. Let's just say that - among the many other reasons - there's a simple volumetric explanation to my lack of a career in single seaters. 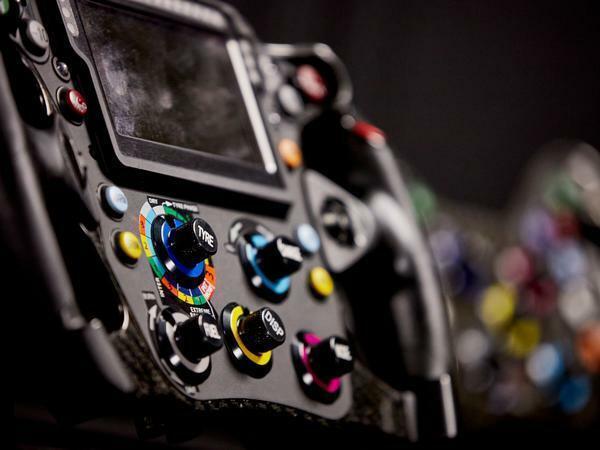 Eventually I'm squashed in, feet raised and looking at a brain-frying F1-grade steering wheel. Goodwin's briefing on this is shorter than I'm expecting: "the gear paddles work and that's your push-to-talk for the comms, but don't worry about anything else. Oh, try to use the clutch when moving off." He indicates a smaller paddle under the right-hand gearchange. "It gets a bit confused if you don't, but it won't stall." Before the Valkyrie I'm sent out in a model of what Goodwin describes as a generic supercar, one that's meant to represent the current state of the art - "it's a bit McLaren, a bit Ferrari" - and which will also give a feel for both track and simulator. The lights go down and the simulator platform jiggles as the car is placed onto the track, just after Blanchimont and pointing towards the chicane. A voice in my ear from the control room tells me I can start so I floor the throttle and head off. First impressions are deeply strange. There's movement and a sense of acceleration, then of braking and cornering forces as I hesitantly negotiate the first couple of corners, but it's not the sort of motion that you'd find in a real car. The engine note sounds generic, too - gearchange lights showing when it's time to change up - and despite the huge amount ofthe graphics aren't much cop. Sorry to sound superficial here, but on the wrap-around screen Spa looks closer to the version I remember from Gran Turismo 5 than the crisply rendered one in Forza Motorsport 7. But I'm also struggling with some of the basics. The F1 tub means that left foot braking is the only option and there's no real sensation through the pedal plus some big understeer. It takes a few corners to notice that the turns out only gentle pressure is necessary to stop. The steering is much more talkative, but with the rig's motion giving nudges rather than sustained loadings (which would require a far bigger simulator) I'm finding it really hard to judge velocity. 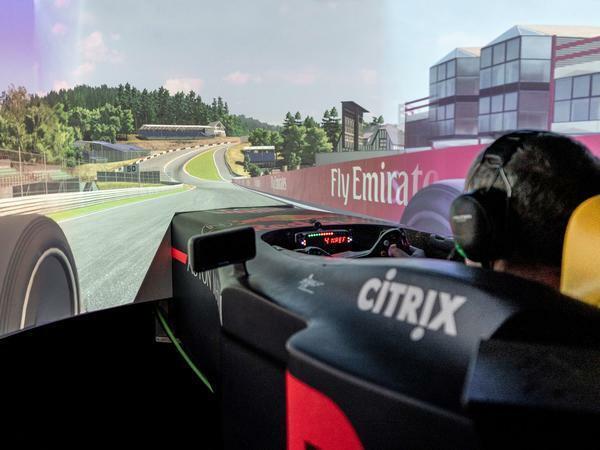 Something that becomes obvious on the second lap when I carry a hugely optimistic speed through Eau Rouge and have such a massive crash into the barrier at Raidillon that the simulator lurches to a halt. "You've crashed the programme," says the voice in my ear, a little less respectfully than before, "it's going to take a couple of minutes to reset it." Eventually I manage up a lap without too many egregious mistakes which can serve as a baseline, I don't get told a time. Goodwin climbs up for a pep talk and I admit that it's not feeling real to me. "That's because it's a tool not a game," he says, "the effort has gone into the software and making the hardware behave that way. 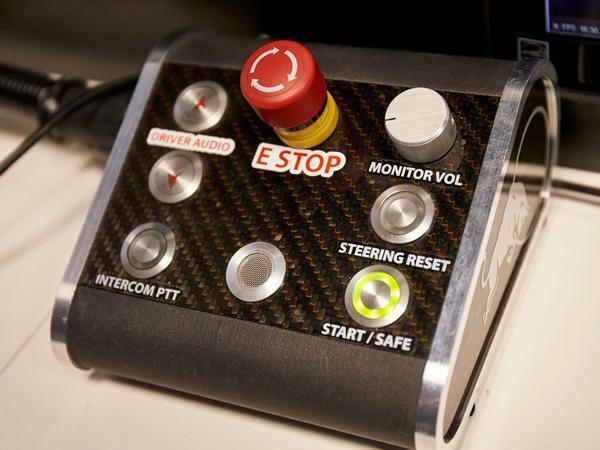 It's a motion platform, but the movement is only enough to inform an experienced simulator driver. It feels completely different to the way a finished car will feel, all simulators do to be honest, but there's a parallel universe of simulator behaviour and real car behaviour, recognising the translation between them is what comes from experience." Pepped up a bit, I'm then sent out in the Valkyrie. The visual cues remain unchanged, the rendered Michelin tyres turning and a single-seat perspective, but there's a V12 engine note and the shift lights only start to illuminate when this is sounding far angrier. It's immediately, obviously, massively quicker - Spa's straights are suddenly feeling much shorter. I'm still finding it hard to judge braking, I'm sure I could leave it much later, but the virtual Valkyrie has huge grip and - I soon discover - equally massive aero downforce. So while I still need to be gentle with the throttle in slower turns, given the lack of stability control, in the quicker stuff it feels pretty much unstickable. Well, not quite: there's another Eau Rouge incident, although this one doesn't crash the simulator, and mistakes keep coming as I try to up my pace. I manage one almost clean lap and then, after a couple of mistakes the next time around, build up to what I've decided will be my personal test of the Valkyrie's awesomeness: staying flat from Stavelot to and through the very fast left-hander at Blanchimont and all the way to the chicane. It does it without drama. Then I'm out of time and the vastly expensive simulator can be put back to earning its keep. Despite the lack of physical effort, I'm feeling less-than-fresh after 25 minutes in the car. The surround screen and motion has persuaded my body it's been doing some proper speeds and I'm feeling a twinge of motion sickness. Goodwin - who often does five hour stints - says you get used to it. Although a full set of data has been harvested from my time behind the wheel to add to the 700Gb that Red Bull has already logged; I doubt mine will be used for anything except the sim team's Christmas blooper reel. Very little is shared with me, Aston doesn't want me to try and extrapolate Valkyrie performance even from my modest pace. But I am given one number: my fastest lap in the Valkyrie was 25 seconds quicker than my best one in the generic supercar. Obviously I've been improving throughout my time in the sim, but that still seems like a ludicrous difference. Goodwin insists it is not. "I talk to customers who have paid good money for this car, and they don't know what they've got," he says, "there will only be an upside to it because I don't think people can really have any idea what the performance level of this car will be until they actually experience it, nor will they be understanding quite how user friendly it's going to be." If reality gets as close as Aston promise, the Valkyrie is going to be a true reset point for this part of the market. Excellent article, very well written. Can only imagine the reality of a machine like this. Whether anyone who just happens to have the money should be allowed to own one and drive it within a mile of other humans is another matter. "It takes a few corners to notice that the turns out only gentle pressure is necessary to stop." I used to love Hard Drivin growing up. Great feedback from the wheel. Interesting article. Having done some simulator work looking at the integration of ESP into them, I can say that as it stands, no one has a tyre model capable of doing anything meaningful for the development of these systems, but it’ll hopefully get there eventually.